Fun games, activities, sports, crafts, cooking and more! 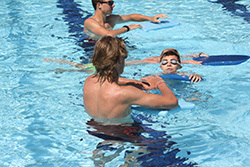 Our staff can transport campers to other activities including swim lessons and sports camps. New in 2019, you can register for only the days you need using our new daily fee option! Register for swim lessons at the same time as Kinder Kamp, Camp Heritage or Teen Camp and receive 10% off swim lesson registration. Campers should sign up for the 10:15 am session. Click here for swim lesson information. KinderKamp is a fun filled five day a week camp especially designed for students entering Kindergarten. Campers will spend their summer playing games outside, making new friends, participating in arts and crafts, listening to music and more. Campers will split their time between inside and outside activities. Campers will swim on Mondays and Wednesdays. Deadline: All participants must be registered by the Thursday prior to the camp session to ensure their spot. Camp Heritage is a fun filled, all day camp. Campers will be outside and play different games, participate in crafts, go to the pool and take a field trip once a week. The cost of the field trip is included in the fee. Field trips are not optional. If your child is in attendance on the day of the field trip, he/she will attend the trip. Teen Camp offers the opportunity to work on developing leadership skills, responsibility, and new experiences. In Teen Camp you will be an important part of making decisions on games, activities, crafts and more. You may go for long bike rides, go fishing, grill out for lunch and more! Teen Camp participants will also receive a 10% discount on the Friday Teen Trips that are held during the weeks that the teen is registered for. Friday Teen Trips can be found here. Register for Camp 1 of 2 convenient ways! Register on a per session basis by the Thursday of the week prior to the session beginning. Sign up for the entire summer of Camp before June 1 and you’ll have the option of being put on an automatic weekly payment plan charged to your debit or credit card and you will be able to predetermine a one week vacation period that your child will not attend camp that you will not be charged for. Not looking for a 5 day a week camp? Now you can register for only the days you need! Kinder Kamp, Camp Heritage, and Teen Camp Daily Fee is only $26/$32 per day! Come have all your questions about Camp Heritage, Teen Camp, and KinderKamp answered, meet our Camp Supervisors, learn all about what you and your child can expect this summer and learn what we need from you to ensure a fun summer for everyone! All parents/guardians that have registered or are considering registering their child for either camp program should attend this meeting. Please note all campers must be registered the Thursday prior to the session start. A qualified adult director supervises each camp session. Counselors at each session are a mixture of adults, and enthusiastic college and high school students. All staff complete a training program and are certified in first aid and CPR and each counselor carries a first aid kit at all times.